Well, not quite, but that’s how it felt, according to pupils in the Lower Third Form who climbed Galley Hill during their History Field Trip. The first objective was to get an aerial view looking down on the site and to try and identify the whereabouts of the 4,000 year old fortifications. Having climbed Warden Hill, pupils took a rest on the north side of the summit where they had a clear view of Galley Hill and its approach. Thankfully the earthwork defences could clearly be seen zig-zaging across foot of the hill. The class then descended Warden Hill in a crocodile line and made their way towards the ditches. 4,000 years ago the fortifications would have been several metres high and the ditches at least 2 metres deep. 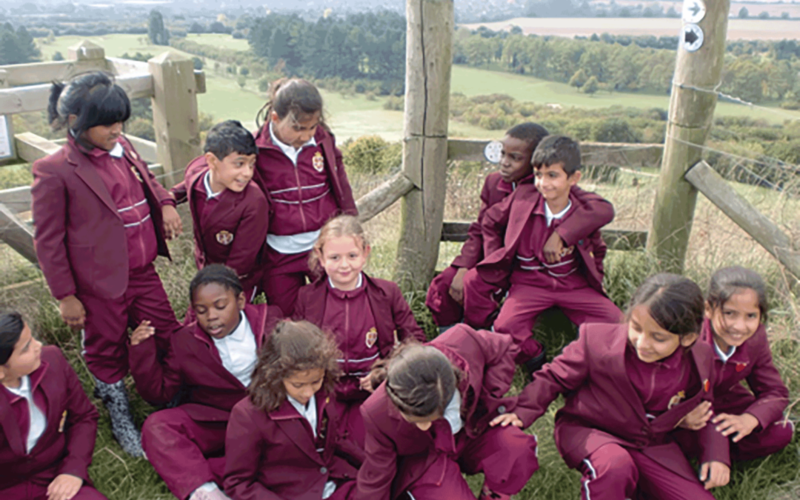 After the site was photographed, children took a further rest before resuming their journey to the summit of Galley Hill where two Bronze Age Barrows were discovered by archaeologists in 1962. More photographs were taken at the summit before the trek back to ground-level began. “It was even more exciting coming down” according to Iram Mhatay. The final task, before heading back to school on the coach, was to find the place where the earthworks began. This was found a short distance from the South Beds Golf Club and was also photographed.